Alfonso was born in Madrid on 17 May 1886. He was the posthumous son of Alfonso XII of Spain, who had died in November 1885, and became King of Spain upon his birth. Just after he was born, he was carried naked to the Spanish prime minister on a silver tray. Five days later he was carried in a solemn court procession with a golden fleece round his neck and was baptized with water specially brought from the River Jordan in Palestine. The French newspaper Le Figaro described the young king in 1889 as "the happiest and best-loved of all the rulers of the earth". His mother, Maria Christina of Austria, served as his regent until his 16th birthday. 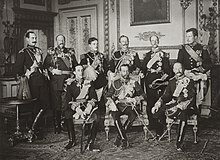 During the regency, in 1898, Spain lost its colonial rule over Cuba, Puerto Rico, Guam and the Philippines to the United States as a result of the Spanish–American War. When he came of age in May 1902, the week of his majority was marked by festivities, bullfights, balls and receptions throughout Spain. He took his oath to the constitution before members of the Cortes on 17 May. By 1905, Alfonso was looking for a suitable consort. On a state visit to the United Kingdom, he stayed at Buckingham Palace with King Edward VII. There he met Princess Victoria Eugenie of Battenberg, the Scottish-born daughter of Edward's youngest sister Princess Beatrice, and a granddaughter of Queen Victoria. He found her attractive, and she returned his interest. There were obstacles to the marriage. Victoria was a Protestant, and would have to become a Catholic. Victoria's brother Leopold was a haemophiliac, so there was a 50 percent chance that Victoria was a carrier of the trait. Finally, Alfonso's mother Maria Christina wanted him to marry a member of her family, the House of Habsburg-Lorraine, or some other Catholic princess, as she considered the Battenbergs to be non-dynastic. Victoria was willing to change her religion, and her being a haemophilia carrier was only a possibility. Maria Christina was eventually persuaded to drop her opposition. In January 1906 she wrote an official letter to Princess Beatrice proposing the match. Victoria met Maria Christina and Alfonso in Biarritz, France, later that month, and converted to Catholicism in San Sebastián in March. In May, diplomats of both kingdoms officially executed the agreement of marriage. Alfonso and Victoria were married at the Royal Monastery of San Jerónimo in Madrid on 31 May 1906, with British royalty in attendance, including Victoria's cousins the Prince and Princess of Wales (later King George V and Queen Mary). The wedding was marked by an assassination attempt on Alfonso and Victoria by Catalan anarchist Mateu Morral. As the wedding procession returned to the palace, he threw a bomb from a window which killed or injured several bystanders and members of the procession. On 10 May 1907, the couple's first child, Alfonso, Prince of Asturias, was born. However, Victoria was in fact a haemophilia carrier, and Alfonso inherited the condition. Neither of the two daughters born to the King and Queen were haemophilia carriers, but another of their sons, Gonzalo (1914–1934), had the condition. Alfonso distanced himself from his wife for transmitting the condition to their sons. From 1914 on, he had several mistresses, and fathered five illegitimate children. A sixth illegitimate child had been born before his marriage. During World War I, because of his family connections with both sides and the division of popular opinion, Spain remained neutral. The King established an office for assistance to prisoners of war on all sides. This office used the Spanish diplomatic and military network abroad to intercede for thousands of POWs – transmitting and receiving letters for them, and other services. The office was located in the Royal Palace. Alfonso became gravely ill during the 1918 flu pandemic. Spain was neutral and thus under no wartime censorship restrictions, so his illness and subsequent recovery were reported to the world, while flu outbreaks in the belligerent countries were concealed. This gave the misleading impression that Spain was the most-affected area and led to the pandemic being dubbed "the Spanish Flu." Following World War I, Spain entered the lengthy yet victorious Rif War (1920–1926) to preserve its colonial rule over northern Morocco. Critics of the monarchy thought the war was an unforgivable loss of money and lives, and nicknamed Alfonso el Africano ("the African"). Alfonso had not acted as a strict constitutional monarch, and supported the Africanists who wanted to conquer for Spain a new empire in Africa to compensate for the lost empire in the Americas and Asia. The Rif War had starkly polarized Spanish society between the Africanists who wanted to conquer an empire in Africa vs. the abandonistas who wanted to abandon Morocco as not worth the blood and treasure. Alfonso liked to play favourites with his generals, and one of his most favored generals was Manuel Fernández Silvestre. In 1921, when Silvestre advanced up into the Rif mountains of Morocco, Alfonso sent him a telegram whose first line read "Hurrah for real men! ", urging Silvestre not to retreat at a time when Silvestre was experiencing major difficulties. Silvestre stayed the course, leading his men into the Battle of Annual, one of Spain's worst defeats. Alfonso, who was on holiday in the south of France at the time, was informed of the "Disaster of the Annual" while he was playing golf. Reportedly, Alfonso's response to the news was to shrug his shoulders and say "Chicken meat is cheap", before resuming his game of golf. Alfonso remained in France and did not return to Spain to comfort the families of the soldiers lost at the "Disaster of the Annual", which many people at the time saw as a callous and cold act, a sign that the King couldn't care less about the lives of his soldiers. In 1922, the Cortes started an investigation into the responsibility for the Annual disaster and soon discovered evidence that the King had been one of the main supporters of Silvestre's advance into the Rif mountains. After the "Disaster of the Annual", Spain's war in the Rif went from bad to worse, and as the Spanish were barely hanging onto Morocco, support for the abandonistas grew as many people could see no point to the war. In August 1923, Spanish soldiers embarking for Morocco mutinied, other soldiers in Malaga simply refused to board the ships that were to take them to Morocco, while in Barcelona huge crowds of left-wingers had staged anti-war protests at which Spanish flags were burned while the flag of the Rif Republic was waved about. With the Africanists comprising only a minority, it was clear that it was only a matter of time before the abandonistas forced the Spanish to give up on the Rif, which was part of the reason for the military coup d'état later in 1923. On September 13, 1923, General Miguel Primo de Rivera, seized power in a military coup. He ruled as a dictator with Alfonso's support until 1930. It is believed that one of Alfonso's main reasons for supporting the coup was his desire to suppress the publication of the damning Cortes report into the Annual disaster. The poetic Generation of '27 as well as Catalan and Basque nationalism grew in this era. In January 1930, due to economic problems and general unpopularity, Miguel Primo de Rivera resigned as Prime Minister. Alfonso, as the Prime Minister's ally, shared the popular dislike. The King had so closely associated with the Primo de Rivera dictatorship that it was difficult for him to distance himself from the regime he had supported for almost seven years. In April 1931, General José Sanjurjo told him even the army was not loyal. On 12 April, the republican parties won a landslide victory in municipal elections. The municipal elections were fought as a virtual referendum on the future of the monarchy. Alfonso fled the country on 14 April as the Second Spanish Republic was proclaimed, but did not formally abdicate. He eventually settled in Rome. By a law of 26 November 1931, Alfonso was accused by the Cortes of high treason. This law would later be repealed by a new law dated 15 December 1938, signed by Francisco Franco. In 1933, his two eldest sons, Alfonso and Jaime, renounced their claims to the throne, and in 1934 his youngest son Gonzalo died. This left his third son Juan, Count of Barcelona his only male heir. Juan later was the father of Juan Carlos I. When the Army rose up against the democratically elected Republican Government  and war broke out, Alfonso made it clear he favoured the "Nationalist" military rebels against the Republic. But in September 1936 the Nationalist leader, General Francisco Franco, declared that the Nationalists would not restore Alfonso as king. (The Nationalist army included many Carlist supporters of a rival pretender.) Nevertheless, Alfonso sent his son Juan to Spain in 1936, to participate in the uprising. However, General Mola had Juan arrested near the French border and expelled from the country. On 29 September 1936, upon the death of Infante Alfonso Carlos, Duke of San Jaime (the Carlist pretender), Alfonso also became the senior heir of Hugh Capet and so was hailed by some French legitimists as King Alphonse I of France and Navarre. On 15 January 1941, Alfonso XIII abdicated his rights to the vacant Spanish throne in favour of Juan. He died in Rome on 28 February of that year. In Spain, the caudillo Franco ordered three days of national mourning. His funeral was held in Rome in the Church of Santa Maria degli Angeli e dei Martiri. Alfonso was buried in the Church of Santa Maria in Monserrato degli Spagnoli, the Spanish national church in Rome, immediately below the tombs of Pope Callixtus III and Pope Alexander VI. In January 1980 his remains were transferred to El Escorial in Spain. Alfonso was a promoter of tourism in Spain. The need for the lodging of his wedding guests prompted the construction of the luxury Hotel Palace in Madrid. He also supported the creation of a network of state-run lodges (Parador) in historic buildings of Spain. His fondness for the sport of football led to the patronage of several "Royal" ("Real" in Spanish) football clubs, the first being Real Club Deportivo de La Coruña in 1907. Selected others include Real Madrid, Real Sociedad, Real Betis, Real Unión, Espanyol and Real Zaragoza. An avenue in the northern Madrid neighbourhood of Chamartín, Avenida de Alfonso XIII, is named after him. A plaza or town center in Iloilo City, Philippines (now Plaza Libertad) was named in his honour called Plaza Alfonso XIII. A street in Merthyr Tydfil, in Wales, was built especially to house Spanish immigrants in the mining industry and named Alphonso Street after Alfonso XIII. Alfonso XIII appears as "King Buby" in Luis Coloma's story of Ratoncito Pérez (1894), which was written for the King when he was 8 years old. The story of Ratoncito Pérez has been adapted into further literary works and movies since then, with the character of Alfonso XIII appearing in some. Alfonso XIII is also mentioned on the plaque to Ratoncito Pérez on the second floor of "la calle del Arenal". On 31 May 1906, Alfonso married Scottish-born Princess Victoria Eugenie of Battenberg (1887–1969). Only entitled to the style of Serene Highness by birth, Ena, as she was known, was granted the higher honorific of Royal Highness one month before her wedding. Charles Maxime Victor of Saint Glen (3 July 1914 – 20 May 1934). Alonso of Borbon Sousa (28 December 1930 – 30 April 1934). Empire of Japan: Order of the Chrysanthemum – 1930 – Emperor Hirohito's second brother, Prince Takamatsu, travelled to Madrid to confer the Great Collar of the Chrysanthemum on King Alfonso. This honour was intended, in part, to commemorate the diplomatic and trading history which existed long before other Western nations were officially aware of Japan's existence. Prince Takamatsu travelled with his wife, Princess Takamatsu, to Spain. Her symbolic role in this unique mission to the Spanish Court was intended to emphasize the international links which were forged by her 16th-century ancestor, Ieyasu Tokugawa. In the years before the Tokugawa shogunate, that innovative daimyō from Western Japan had been actively involved in negotiating trade and diplomatic treaties with Spain and with the colonies of New Spain (Mexico) and the Philippines; and it was anticipated that the mere presence of the Princess could serve to underscore the range of possibilities which could be inferred from that little-known history. Persia: Order of the Aqdas – 16 May 1902 – The King received the Persian order in a special ceremony during his enthronement festivities. Russian Empire: Order of St. Andrew the Apostle the First-Called – 1902 – During his enthronement festivities. Sweden: Knight of the Order of the Seraphim – 16 May 1902 – King Oscar II of Sweden sent his youngest son, Prince Prince Eugen to represent him at the festivities marking the King's enthronement, and he invested the King as a Knight in a special ceremony on 16 May 1902. 815th Knight of the Order of the Garter – 16 May 1902 – King Edward VII's brother, the Duke of Connaught attended the festivities marking the King's enthronement, and invested him as a Knight in a special ceremony on 16 May 1902. In the Royal Library of Madrid, there are many books with different emblems and super libros of the king. ^ "Royal Wedding #1: Princess Victoria Eugenie of Battenberg & King Alfonso XIII of Spain". Edwardian Promenade. Retrieved 25 June 2015. ^ "Reinas Borbones de cuidado". elmundo.es. Retrieved 25 June 2015. ^ his wife was British, his mother Austrian, amongst other family relationships. 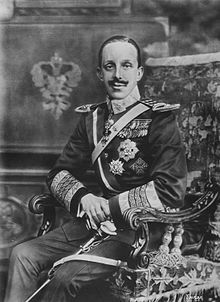 ^ ""Royal Knight of Charity": King Alfonso XIII of Spain in WWI". loc.gov. Retrieved 19 January 2018. ^ "Rebelion. Prlogo para "Alfonso XIII: un enemigo del pueblo" de Pedro L. Angosto". rebelion.org. Retrieved 25 June 2015. ^ a b c d Perry, James Arrogant Armies Great Military Disasters and the Generals Behind Them, Edison: Castle Books, 2005 page 286. ^ Perry, James Arrogant Armies Great Military Disasters and the Generals Behind Them, Edison: Castle Books, 2005 page 280. ^ Perry, James Arrogant Armies Great Military Disasters and the Generals Behind Them, Edison: Castle Books, 2005 page 284. ^ See: Ley concediendo la nacionalidad española a D. Alfonso de Borbón. Boletín Oficial del Estado no. 173, 20/12/1938, p. 3039. ^ "Italians to Mourn Death of Alfonso," The New York Times. 2 March 1931. ^ "21 Guns for Dead King's Homecoming", The Times (21 January 1980): 4. ^ "Deportivo history – Football Espana". football-espana.net. Retrieved 25 June 2015. ^ "Plaza Libertad: The face of Ilonggo History". Iloilo I LOVE!. Retrieved 25 June 2015. ^ Morris, Jan. The Matter of Wales (1986 ed.). Penguin Books. p. 339. ISBN 0-14-008263-8. ^ Faustino Menéndez Pidal de Navascués; María del Carmen Iglesias (1999). Símbolos de España. ISBN 978-84-259-1074-6. ^ a b Dotor, Santiag. "Discussion on the 1931 addition of Jerusalem arms". Royal Banner of Spain (1761–1931). Flags of the World. Retrieved 19 March 2013. ^ Eduardo García-Menacho y Osset (2010). Introducción a la Heráldica y Manual de Heráldica Militar Española. Ministerio de Defensa. Subdir. Gral. Publicaciones. pp. 105–107. ISBN 978-84-9781-559-8. ^ Ricardo Mateos Sáinz de Medrano (2007). La reina María Cristina: madre de Alfonso XIII y regente de España. ISBN 978-84-9734-638-2. ^ Collier, William Miller. (1912). At the Court of His Catholic Majesty, pp. 35–36; Order of the Golden Fleece. ^ Miller, pp. 37–38; Orden de Carlos III (in Spanish) Archived 24 August 2007 at the Wayback Machine. ^ Miller, pp. 39–39; Order of Santiago Archived 28 January 2008 at the Wayback Machine. ^ Miller, pp. 39–39; Order of Calatrava Archived 10 February 2008 at the Wayback Machine. ^ Miller, pp. 39–39; Order of Alcántara Archived 13 February 2008 at the Wayback Machine. ^ Miller, pp. 39–39; Order of Montesa Archived 13 February 2008 at the Wayback Machine. ^ "Japan to Decorate King Alfonso Today; Emperor's Brother Nears Madrid With Collar of the Chrysanthemum for Spanish King," New York Times, 3 November 1930; see also Nutail, Zelia. (1906). The Earliest Historical Relations Between Mexico and Japan, p. 2. ^ a b c "The King of Spain´s enthronement". The Times (36770). London. 17 May 1902. p. 7. ^ "Grand Crosses of the Order of the Tower and Sword". geneall.net. Retrieved 2018-09-22. ^ "No. 27803". The London Gazette. 9 June 1905. p. 4107. ^ > "Real Biblioteca – Búsqueda por ex libris". realbiblioteca.es. Retrieved 25 June 2015. Nuttall, Zelia (1906). The earliest historical relations between Mexico and Japan: from original documents preserved in Spain and Japan. The University Press. Wikimedia Commons has media related to Alfonso XIII of Spain.